As the weather warms and the daylight stretches long into the night, I find myself nostalgic for folk dancing. I was fifteen the first time I went walking through the Vilnius Old Town with friends and followed the growing sounds of music and laughter into an oft-ignored inner courtyard. Coming through its archway, we encountered a swirling crowd of people dancing to the beats of half a dozen Lithuanian folk musicians’ instruments. There were fiddles, a cello, pipes, an accordion, and a drum, all carrying an even oomp-a oomp-a rhythm that echoed up and out of the courtyard’s neoclassical walls. Though the tune was unfamiliar, there was a decidedly inclusive quality to it—a welcoming warmth that seemed to accompany its notes and fill me from top to toe with anticipation of the dance. Beside me, my friend Lorena grabbed my hand. “Come on!” she smiled, breaking my reverie as she tugged me over a trampled flower bed and onto the cobblestone square. We paused on the edge of the circle of dancers and watched as two twenty-somethings bounced by, kicking their legs out in time to the music. They were followed by a little girl reaching up for her grandfather’s hands as they spun–not quite as on-tempo, but done so with enormous enthusiasm. That’s the thing about Lithuanian folk dancing: it doesn’t matter whether someone is five or ninety-five, a professional folk dancer or the owner of two left feet, everyone is welcome to join in the dance if so inclined. Having observed enough to have a sense of this dance’s basic steps, Lorena and I joined the whirlwind. Our feet were clumsy at first, but we soon settled into the music and found ourselves laughing and turning in time with the couples beside us. As one dance flowed into another, as dancers left to catch their breath only to have the music entice them back into the circle, we all danced on into the night. And we were utterly and completely happy. Hi, I’m Patrick Carrique, a proud Canadian citizen and an avid defender of the “True North, Strong and Free. ” My voyage to Northern Indiana takes a grand total of six driving hours. I live within 60 minutes of The United States, speak English as my first language and have been immersed in American culture since birth. Before travelling to study at Notre Dame I expected very little to be different from home. In fact, “Culture Shock” was not something that even crossed my mind. Upon my arrival however, it took no more than 10 minutes for that to change. While generally accepted with open arms, I soon realized that being Canadian would become an unexpected and unavoidable identifier for me. As I introduced myself (even to the people who soon became my closest friends), I couldn’t help but notice a kind of wide-eyed excitement. As soon as my nationality was brought up I found myself bombarded with questions. It is kind of a fun social experiment when meeting new people here. “Would you just say “Eh!” for me? Or “ABOOT”? These are questions I hear on a weekly basis, even now in my sophomore year. I don’t take any real offense to them (for the most part), and I believe that most of them are asked in a light-hearted and truly interested manner. I simply did not expect this kind of response though. Our countries share the world’s longest land border, have one of the most active trading relationships on Earth and generally follow pretty similar cultures. For these reasons, I did not prepare myself for any type of cultural adjustment; I soon learned that this was a misguided mentality to follow. In truth, Canada and the United States are different. Perhaps not always explicitly visible or universally recognized but these are two distinct places, offering unique and fantastic experiences. We are different people, with different cultural values, different customs and varied identities. Alike to most college students, my identity changed coming into my freshman year. I was now the Canadian, “the almost-fake international student”, a man of skewed vowel sounds, a tendency to over-apologize and a charm that can only come from a Canuck upbringing. My advice to incoming international students, whether from Canada or anywhere else is to realize that regardless of where you come from, culture shock might just rear its head. It does not have to be a negative experience though. So if a nationality identifier gets tagged on you, rock it. Show them pictures of home, stay true to who you are and try to not take any stereotypical questions too seriously. If you’re Canadian, get ready for some questions about moose, keep using Celsius and make sure to get together with some friends to celebrate Canadian Thanksgiving. The University of Notre Dame and the Chinese University of Hong Kong have an international exchange program where two students from each university undertake studies at the other university each semester. This past year, I was fortunate to participate in this program for both semesters of my junior year. It was an incredible and nearly indescribable experience on so many levels. 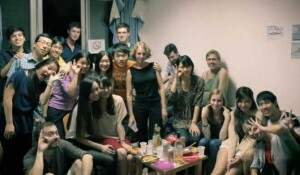 While my own study abroad experience was uniquely personal for reasons of family and return, there were also the typical stories of study abroad, though typical does not in any way mean less meaningful. They say Hong Kong is a cosmopolitan city and the menagerie of foreign exchange students at the Chinese University of Hong Kong reflected just that. I became friends with countless people from all over the world, each with their own story of where they came from and where they were going. Everyone had a different reason for being in Hong Kong. Some came for the local Chinese culture, some for a taste of the fast-paced Asian New York City, and some just to try something different, something new, something bold. And of course, some for Lan Kwai Fong, the infamous bar district of Hong Kong. But for some reason or another and by the luck of sheer coincidence, we had gathered from all corners of the world in one place. The diversity of thought and opinion on nearly every single issue from world politics to cuisine to fashion was disorienting and exhilarating. What kinds of clothes do the Swedes prefer? How do the Chinese and Japanese feel about the Diaoyu/Senkaku islands? What different kinds of dim sum (traditional Cantonese style of serving food) did the Dutch and Koreans prefer? It was quite the miniature United Nations we had. Yet we were still able to bond as close, genuine friends. Because we were all simultaneously dealing with the culture shock of a new environment, and one as intimidating as Hong Kong with its overly crowded streets and subway stations and walls of towering apartment blocks, we were all foreigners in a foreign land. This probably drew us closer than we knew. 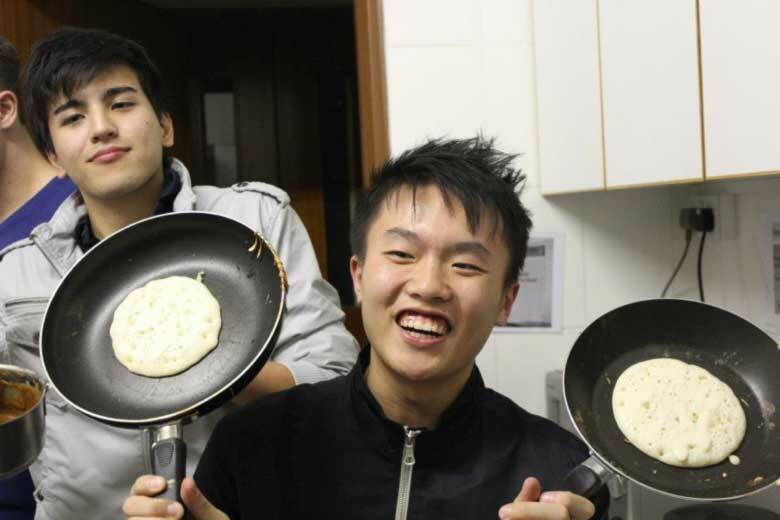 Thanks to a couple of our friends, our group organized pancake parties where once every few weeks, someone would make a variation of pancakes from their nation. Everyone brought snacks and drinks and a jolly good time was had. I think by the end, a total of 7 pancake parties were organized and countless pancakes consumed. Towards the end of the first semester near Christmas time, one of our Dutch friends, Thomas, suggested we do a secret Santa as well as write a poem for the giftee. As many of our friends were about to depart the shores of Hong Kong, needless to say, there were not just a few soggy eyes. Alas, everyone has now separated, each returning to their respective universities and countries. Yet, we will always be able to remember back onto our exchange time in Hong Kong with fond memories. Not just of the city and its lights, but of the people and experiences. 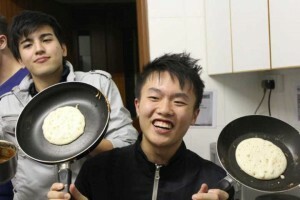 Though there was not an IHOP in sight, as silly as it sounds, whenever I chance upon a waft of pancakes in the air, I’ll be brought back to Hong Kong, to the Chinese University, to International House, and wonder where my friends might be in the world and hope that we might once again share another bite. I still remember when I first met you at super seafood. Super short and super nice was what I conclude. Born and raised in Sweden and spoke as such. Your diverse background was one of the first to open my eyes. That there is truly a big world under these skies. In your time here, I know there were a few bumps in the road. But keep in mind that everyone saw the kindness you showed. I will definitely miss you as you return home in just a few weeks. I am sure there will be tears on many a cheeks. These friends you have made from all over the world are people you can count on. Never forget the good times and keep them as fond memories to look back on. And don’t forget to always remember pancakes in Hong Kong. For these memories will be with you lifelong. When I was little, we used to go to Summer Shakespeare every year as a family; I remember thinking how gorgeously grown-up and palatial Washington Hall seemed, where all productions took place before DeBartolo Performing Arts Center was built. Entering the building was like a precursor to the suspension of disbelief that the imaginary world requires, and my childlike self was all too willing to be scooped up and flown away for an adventure. The second to last Saturday night this August I did not have this attitude when I entered the theatre in DPAC. It was a long month of hosting orientations for school, I had just gotten sick, and classes were right around the corner, but there I was about to see Richard III with my sister. We had both been keen to see the play in the spring after the excavation of Richard III’s bones in Leicester, but it was now with a sigh that I settled in my chair. As the house lights dimmed and the tinny prerecorded announcement to silence cell phones ended, however, the anticipation of the theatre began to buzz. I am a self-professed lover of Shakespeare: I have taken multiple classes on his plays, I own his collected works, I recite sonnets every year on Valentine’s Day in O’Shaughnessy Hall. The familiarity of and affection for his work is always able to claim my attention, and this night was no different. We are greeted, of course, with Richard himself, opening with one of the infamous soliloquies: “Now is the winter of our discontent/ Made glorious summer by this sun of York;/ And all the clouds that lour’d upon our house/ In the deep bosom of the ocean buried.” This particular Richard was eerie not for his grotesque characterization, but rather for his more charming nature and dashing countenance, as we see in his manipulative courtship of the widow of a man he has killed. The act closes with another soliloquy from Richard, this time much more intimate with the audience, as the actor sat on the very edge of the stage twirling a rose he had taken from the lady’s mourned husband. Enraptured, I was caught entirely off guard when Richard gazed in my direction and tossed me his rose before exiting the stage. I was enchanted. I was charmed. I was smitten. Here I was at the theatre, always full to brimming with magic and wonder and joy, and a pretty boy saying sweet nothings had just broken the fourth wall and given me a flower. I fell in love with the theatre all over again that night, as I do in some small way every time I go. This, it occurs to me, is what “culture” in all its multivarious dimensions is all about. Culture is being spellbound by actors on a stage for two hours and going to see a German band in Chicago next month and walking aimlessly through Central Park for hours on a Sunday afternoon. Culture is the light in the eyes of a child exploring a world of possibility and promise and the renewed hope of the jaded twenty-something. Culture is how we engage the world, by seeing all the most beautiful things it has to offer, no matter from where or with whom. Globe-trotting is always fun and exotic. Cool blue waters on a deserted Mediterranean Island, enticingly lush forests in the Amazon, challenging yet rewarding hikes up the world’s tallest peaks in the Himalayas, or spying on Saharan elephants on a safari. Some will proclaim the eternal “travel bug” of having to go and see new sights or taste new flavors. The Eiffel Tower by moonlight, a casual stroll down the streets of Brazil, or a lively tea ceremony in Japan – sign me up! On those days you’re bored with your average lunch fare, all you can think of is Ethiopian lentils, Indian chai, or Italian Gelato. I’m as much of a foodie as the next person. But what about something else, something obvious but not much pondered over? You know what really gets me about traveling? The people. The world begins and ends with us. Without us, there would be no us. Moving past this escalating existential trend, what I mean to say is that you can travel to unknown and striking moments just with an interaction with another person. Interning with the Fulbright Program in Washington DC has opened my eyes to the plethora of international-oriented ideas you can have right where you are. Scholars come here from everywhere, we send grantees to ever corner of every country, and all our conversations in the office involve at least two or more continents and/or languages. I grew up all over and visited the world. I’ve seen people I admire, respect, envy, and avoid – but they’re all people who make this world what it is. You never have something to lose by interacting with someone, but you always stand something to gain. So, why not? 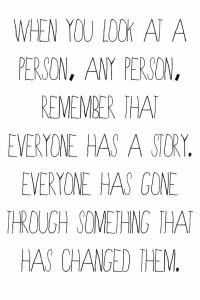 Everyone has a story (just like you), and everyone’s story has a life of its own. Someone once famously (and wisely) said, “Our lives are storybooks that we write for ourselves; wonderfully illustrated by the people we meet”. Isn’t it though? What would your life be if not for the people who have been in it? We are people, and we thrive on our lives revolving around each other. Why am I writing about this? Because I think that we are sometimes so caught up in continuing our own story, in trying to outdo our own imagination in the revels of what might be most fabulous, that we forget that there are people all around us – just like ourselves – who have a story. 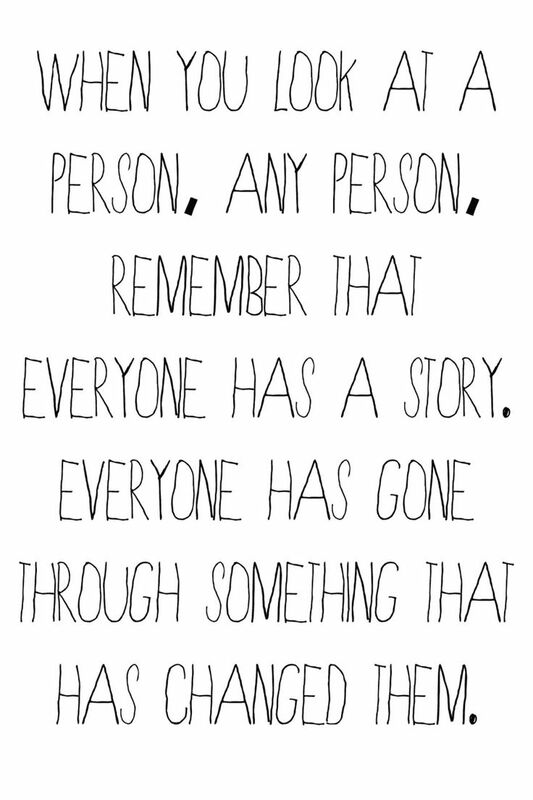 People who have gone through something, anything, that has changed them and made them who they are. So go out and explore, adventure with the countless souls you encounter each day, and remember that sometimes you can travel far by not traveling at all. I’ve met people who have told me their life stories, and I’ve met people who have honked at me as I run off the street and out of their way; they’ve all inspired me to reflect on my own life in many ways – on life in general. I find it incredible that the world over, people are from so many different places, so many backgrounds, so many circumstances; but somehow, we find each other and we find out that we have something in common. We can relate to someone, we can identify with an idea (from across the world or from right next door), we can seize the moment of connection. That moment is what I crave, more than drinking piña coladas in the Caribbean, more than skiing down peaks in New Zealand, maybe even more than a hot-air balloon ride over the Pyramids. Wherever you are, wherever you go, take a moment to look around…at the people. school in the United States, echoing throughout the following years. unfortunately, usually taken for granted. situational and flexible—when the violation of rules is harmless and intended well. It’s Easter Triduum here at Notre Dame, and quite a fine one. The sun is out, the weather is perfect, the hordes of alums and parents are visiting to sit like sardines in the Basilica for hours on end. It’s the first time I’ve been on campus during the Easter break, since I’m from the Bend: usually my family does attend the Basilica masses, but not this year. My family’s in town visiting from their new home, but I’ve spent most of the weekend on campus with my friends. It’s a bit strange for me, since I’ve never had to deal with the truncated dining hall hours, the quiet of the partially empty dorm, or the sense of being on break (not having spent quite so many hours waiting for the Basilica doors to open). It’s been nice to have that quiet for my homework, for working on plans for my future, to get some sleep – but my favorite thing has been how much time I’ve been able to spend with my friends. There are plenty of kids who don’t go home for what’s really only a four-day weekend, but my international friends really don’t have much of an option about staying or not, for the most part. Regardless of the circumstances, it’s been wonderful to spend some free time together with my friends: watching silly romcoms, trips to Kilwins for after-dinner dessert, spending some time discussing abstract and real problems for two hours in the middle of it all. These are the times I’ll remember when I gradu—wait, not using that word just yet. But these are the moments that I value most of all, and basking in them this weekend is the best Easter experience I’ve had. It’s also wonderful to hear about my friends who have adopted or been adopted by others here. Friends to hang with in Chicago, local religious services instead of Notre Dame’s, foster parents here in America; these are the most touching things over this weekend for me, seeing how all of my international friends, Catholic or not, have made themselves at home here, who can feel like they belong on a family-oriented holiday. They are most certainly a part of my family, and I’m so glad they’ve chosen to be here with me. So, I realize it’s been a while, but I hope you enjoyed the post from our excellent guest blogger Nikita. Now that the semester is back on track, you’ll be hearing from lovely me more often, promise! I hope all of your holidays were happy (and those to come as well – I’m looking at you, Chinese New Year). I have two things I’d like to share today, and I’ll start with the most adorable one. Last night, two of my friends and I watched the film Love, Actually, possibly the most hilarious, inappropriate, and endearing Christmas movie I’ve ever seen. I’m sure you’ll agree with me if you’ve viewed it, and if you haven’t, go see it asap! Among the various couples in the marvelous ensemble cast, this time my eye was caught by the characters of Colin Firth and Lucia Moniz, who respectively are a Hemingway-esque author vacationing from his life to write and his housekeeper. Firth is an Englishman and Moniz is Portuguese, and neither speaks the other’s language. From just before Thanksgiving to just after Christmas, Firth’s character stays in his cottage writing with Moniz working around him, and various blunders on both sides are made. Each forms an attachment to the other, but Firth returns to his extended family in London before anything happens between the two of them. Regretting his departure, Firth spends the next couple of weeks trying to learn Portuguese and rushes to Moniz’s home to propose to her in broken, but relatively coherent, Portuguese. Moniz, in turn, agrees in fairly fluent English. A month later, the two are seen returning to London, comfortable together and teasing each other easily. Cliché as this might sound, these two people fell in love without ever exchanging words intelligible to the other. Now, I will happily engage in a debate about love and its qualities at another time, but my point here is that it really didn’t matter that they were from different worlds, with different languages, different everything. It didn’t matter. Both of them made the effort to bridge that gap, and got their Hollywood-rosy-colored-glasses happy ending. Realistic or not, I thought this was absolutely uplifting and wonderful. My part two is…connected? Somehow? Give me a chance. My family life has had some significant changes in the last month, and my father just accepted a job offer at a university approximately 650 miles from here, South Bend, where I go to school and where they’ve lived since I was two. I’m going to miss them; even if I don’t go home every weekend to see them, it’s nice knowing they’re right there if I need them, that I can walk twenty minutes from my dorm to my dad’s office to get a hug if I really, really need one. Maybe it just hasn’t sunk in yet, but actually, I’m really happy for them. This is good, it’s going to make them both really happy, and that makes me happy. And even though they won’t be here all the time, even though my dad won’t know everything that’s going on here before I do anymore – they’re still there. Really, this probably sounds a bit strange to international students, because you all have left your own families much farther away than mine to be here. But it feels like a departure to me, and that’s what counts, right? But it will, in the long run, be for the best in the long run. And that’s why all of you are here too, right? So we’ll relish in the adventure, keep our loved ones in our hearts and minds, and look forward to the coming future approaching in all of it terrifying and beautiful glory. Wait, where am I from again? Talk about extreme culture shocks. This semester spent abroad in Athens has been a whirlwind. The past four months have been filled with all things Greek – from the endless fried eggplant and baklava to the countless stray animals that loyally follow every passer-by, from the perfect Mediterranean weather to the “conversations” between people that really sound like heated arguments, and from the afternoon siestas to the very handsome young policemen – this place never gets old. As an international student already at Notre Dame, I had come to identify as an Indian studying abroad in America. My identity as a student prevailed as I adjusted to the various cultural isms encompassing life in the United States. The American classroom was new and the professor-student relationship was a new dynamic that I had certainly come to respect and enjoy. An expert in the greeting “Hi, how are you?” – with no expectation of the truth – integrated me into the mainstream social courtesies. Fireworks on July 4th on the beach and singing Christmas carols galore – the day after a huge Thanksgiving meal – were something I enthusiastically looked forward to. While still relating very much with Indian festivals, spicy food, Bollywood dancing and native languages, two years instilled in me an interesting blend of both American and Indian personalities. Every morning I donned traditional hand-made jewelry and clothes from India while I applied copious amounts of very American lotion and lip balm to keep my skin from dying every time winter comes around in South Bend. Try putting that into context of studying abroad yet again in Europe. 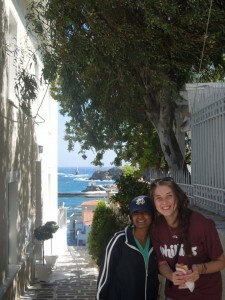 Now I am that “Indian girl who studies in America, but who lives in Greece”. In a class titled Immigration and Nationalism we are dealing with notions of what it means to be a citizen of a certain country, what it means to cross borders and establish new standards of identity. How does one assimilate or integrate within other cultures? And do do all these definitions of nationality and ethnic identity come to express one’s sense of belonging? Heavy concepts that we are still not sure we can decisively agree upon. “There are no foreign lands; it is only the traveler who is foreign”. Indeed, most often people tend to think in terms of how every place they visit is different from “home”. They compare the way people dress (all Greek women only own four-inch stilettoes), what people eat (two words: olives and wine), how they communicate with each other (still attempting to catch on to the sing-song rhythm of modern Greek) and what the place looks like (crystal clear blue waters that entice you to immerse yourself in them all day long). All these things are certainly different the world over, but only in relation to each other. As I have come to settle in and become part of the Greek way of life, all these things have become seemingly obvious. Of course life should come to a standstill every day from 2pm till 5pm to eat and take a nap, clearly you haven’t had enough to drink if you can still coherently ask the waiter for the check, and obviously the cars don’t stop at traffic lights and you just make a run for it whenever the opportunity presents itself. As I wrap up my semester here, it is an intriguing feeling. While I am ecstatic to return to the Fighting Irish and show my solidarity as we battle it out for the National Championship, I also long to go back to India and see family and friends and be spoiled silly. It goes without saying that I will miss Athens, I will miss Greece, and I will miss the love that I have come to cultivate for this wonderful new home. From here on out, “Greek-ness” is yet another identity that I will be able to…identify with. Where next I wonder? I will try my best not to compare everything with the ways things are in Athens, but chances are it will happen anyway. Time to test whether “reverse culture shock” really exists. University of Notre Dame undergraduate student Charles Cong Xu won first place in the Chinese University of Hong Kong’s (CUHK) 2012 Study Abroad Writing Contest. Xu, an undergraduate student majoring in Environmental Sciences with a minor in Chinese, is studying at CUHK for the 2012-2013 academic year. Xu’s winning essay is posted below. Day 35 in Hong Kong: That preserved duck leg I had for dinner was way too salty. It was too bad they ran out of spicy chicken legs. *Yawn* Man, I should really stop Skyping home at 3 in the morning, but it does make me feel less homesick. Now, here I am in the 24 hour study lounge in central campus of the Chinese University of Hong Kong pondering upon the last 19 some years of my existence, trying to make sense of my “story”. I feel like there is too much to say, too much for it all to make sense, for it all to mean something. Practically my entire life has been an international experience and they expect me to condense it down to a mere 2000 words? Impossible I say, but I suppose I should start from the beginning. I was born in the city of Wuhan, China and grew up within the grounds of Wuhan University. From the few pictures hanging on my wall at home to the scattered stories told by my parents, my memories of Wuhan and of China are left vague and surreal. I remember the hot humid nights when I couldn’t fall asleep and all I could do was listen to the chirps and buzzing of insects outside. I remember going out with my parents at night to find the watermelon vendor and slapping countless melons until we found our prize. I remember cutting the watermelon into halves and the three of us would dig in with spoons as if nothing else in the world mattered. I remember the joy of chewing on bite size chunks of fresh sugar cane that my mom had just peeled and cut. I remember my extreme sadness when I learned that my mom was going away for a while, to the United States of America to study. Unbeknownst to me at the time, my mother had successfully applied for a Ford Foundation scholarship to pursue a Master’s degree in Women’s Studies at the University of Northern Iowa in Cedar Falls, Iowa. It mattered little to me. All I knew was that at the age of 5, my 妈妈 was half way around the world and I didn’t know when would be the next time I could see her. 6 months passed and all the legal documents had been filed, the visas applied for, and the flight tickets booked. My first international experience was not by choice, even though I wouldn’t have chosen to stay. My family meant more to me than my hometown; my family was my home. The three of us were again reunited, but this time in a strange and bizarre world that none of us had any experience with. When I first came to the United States, I was distinctly Chinese. I did not know a single word of English and the first thought I had when I saw a McDonald’s was “They have McDonald’s in America too?” I was immediately enrolled in the English as a Second Language (ESL) class at my elementary school. Although I picked up the language rather quickly, I remember I still felt very different. I could not communicate with my classmates or my teacher. I had to point in order to tell the teacher I needed to go to the bathroom. In a town of only 30,000, being Chinese is something special – sometimes good, sometimes bad. There were those who were genuinely interested in learning how to say pencil in Chinese. There were also those who assumed all Chinese people knew Kungfu. Getting picked on and having pieces of paper thrown at you without being able to retaliate without getting physical tends to get you into trouble. I can’t say it wasn’t worth it though. Within a year and a half, I had “graduated” from ESL and moved to the Twin Cities in Minnesota. Language became less and less of an issue, but the cultural differences remained. They say “When in Rome, do as the Romans do”, but I guess I never took that saying to heart. I remember thinking that Americans were quite primitive for eating vegetables uncooked, and it has taken me many years to get used to salads. One of my favorite snack foods in China was干脆面 or dry crispy noodle snacks for kids that are made to be eaten uncooked. Although they are extremely common in China, they are very rare in the U.S. So instead, I started eating uncooked American style ramen as a snack. I even brought it to elementary school with me to eat during break time. I remember it took a lot of convincing to get the first kid to try it. A few weeks later, literally half the class brought their own little ramen bags. The practice even popped up in other classrooms by kids who I didn’t even know. When I look back on this, I’m beginning to realize that I was not just eating uncooked ramen because I enjoyed the taste, but I was reminiscing about my life in China along with all the kinds of food I had grown up with. Yes, I started to like pizza and pancakes after moving to the U.S., but I also brought my home culture with me in the form of uncooked ramen, which was apparently embraced by the local Americans. Little did they know, not only where they enjoying a new snack, but by adopting the practice of eating uncooked ramen for snack, my classmates had helped me feel more accepted as an American. The metaphor of the American “melting pot” was never truer as 干脆面 was added to the pot. Growing up in the U.S., I had a disproportionate amount of Asian friends. Although Asians probably accounted for less than 10% of the population, more than half of my friends were American born Asians or immigrants like me. This is still very much true today, even in my university life. Perhaps the reason is because we have all shared similar experiences of being excluded from the mainstream, of enjoying the same activities, and of having similar issues at home with often overbearing parents, at least compared to our American friends. Communication and mutual understanding is much easier, and you don’t have to explain why you eat rice all the time or why you can’t come out to play because you’re too busy studying or practicing the piano. Fast forwarding some years leads my family and me to South Bend, Indiana. By this time, I had spent more time in the U.S. than in China, and my English had far surpassed my Chinese. Today, although I am able to speak Mandarin conversationally, my reading and writing skills have regressed past what I knew as a first grader in China. Somewhere along the way, I had transformed from being distinctly Chinese to at least moderately American. When my family and I eat watermelon these days, we do so half the time with spoons and half the time in slices. Perhaps all of these things mean that I have assimilated to American culture and have forgotten my roots. Perhaps this is true, but I actually know of many people who have moved to the U.S. like me who have completely forgotten their native tongue. In fact, their parents may not want them to learn Chinese because they feel it would be harder to become “American” that way. I completely disagree and am proud that I can still speak Mandarin. I think there is value to all cultures and being able to transverse between cultures is anything but a disadvantage. 13 and a half years passes faster than one would think and I had not had the opportunity to return to China. I felt like I missed out on all those family gatherings, all those missed birthdays, mid-autumn festivals, and especially Chinese New Years. Some days, I wonder how much closer I would be to my grandparents had we stayed in China. I learned today that one of my cousins is about to have an engagement party in the next month. I didn’t even know she had a boyfriend. I had forgotten what real 干脆面 and I couldn’t even tell you how many provinces are in China if you asked. In a sense, I had forgotten what it meant to be Chinese and was left clinging to my uncooked ramen. I desperately wanted to rediscover my roots, the parts of me that I had left behind. Thus, when I learned that my home university, the University of Notre Dame, had an exchange program with the Chinese University of Hong Kong, I applied immediately as I knew this would be the perfect opportunity for me to return to China. 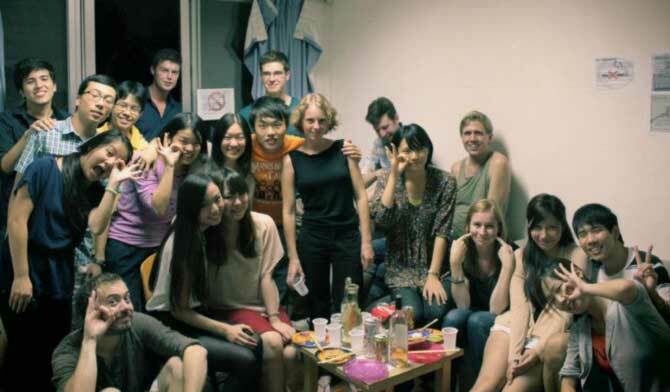 I am the first year-long exchange student from my university, and so far it has been a rollercoaster of an experience. Being truly independent in a different country has brought many difficult and unexpected challenges that I have learned or am still learning to deal with. However, I am beginning to understand the local Hong Kong culture and am also meeting many new faces from literally all over the world. Hong Kong has made me realize just how American I have become. Although I still do not fit into the mainstream culture of America and probably never will, I feel much more out of place in Hong Kong than in Indiana. My homesickness is not of my hometown of Wuhan, but of my friends and family who are all in the U.S. I miss the pizza and I miss the pancakes. However, there are bits and pieces of Chinese culture around Hong Kong that I can still identify with. A few days ago, I bought my first package of 干脆面 at the Park N’ Shop on campus and crunched on it proudly as if my quest of nostalgia had been completed. I’m even more excited about when my parents will come with my little brother to visit me in Hong Kong. We will then return to Wuhan as a family for the first time in 14 years, a once in a lifetime opportunity that will surely bring much joy and tears. You may want to ask me what I have learned from all my experiences or if I have gained anything concrete that I may be able to list off. It is really not like that. I am the result of all my experiences. My personality, my values, and my beliefs all embody my time spent in China, in the U.S., and now in Hong Kong, and they will continue to change as I spend more time here. Reflection is important, but it is only important because it helps encourage learning and personal growth. To me, internationality is not just a label or a point on a resume. Rather, it is a way of life, a way of thinking, a way of interpreting the world. Today, I identify more strongly with the world than with either Chinese or American. As the world becomes smaller and smaller due to the shrinking effects of globalization, more and more people will have significant international experience and be able to identify with not just the community in which they were born into. Internationalism is the way of the future. It doesn’t matter if you are Chinese, American, American born Chinese, or even Chinese born American. You are human, you are you. Embrace the positive experiences and learn from the negative ones. The world is big; the world is inspiring, go.